Summary: Design, supply, installation and subsequent extraction of steel sheet piles to form a temporary pipe pull trench, including pre-augering and the design, supply and installation of associated bracing frames and tie rods. Sheet Piling (UK) Ltd. were employed by Land & Marine to build a temporary pipe pull trench on the beach at Easington, East Yorkshire. The sheet piled trench was constructed between the high and low water marks and was 127m in length, extended by some 50m with three cofferdam pits at the landward end of the trench. The Tunnel Reception Pit enabled the construction of a tunnel from the beach into a shaft within the Centrica Gas Terminal and the Tie-In and Intermediate Pits allowed for the pipe pulling equipment and subsequent gas pipeline welding works. An associated ‘Working Platform’ structure was installed around the sheet pile cofferdam pits to ensure a stable working area was available at all times during tidal conditions and to enable Land & Marine to set up their winching equipment. The ground conditions on site were that of thin deposits of beach sand overlying stiff to very stiff clay, such that a previous scheme at the same location had encountered significant problems in respect of pile installation/extraction together with significant pile damage, a situation all parties wanted to avoid on this scheme. Working closely with Land & Marine from an early stage to develop an optimum sheet pile design and sheet piling installation solution, SPUK proposed to pre-auger the pile line prior to installation using powerful leader mounted vibratory hammers on tracked piling rigs. The length of steel sheet piles varied throughout the project from 6m long to 16m long, with various sections used including PU18-1 and PU28-1 ArcelorMittal Sheet Piles. The piles for the main pipe pull trench were generally 10m long, with the landward sheet pile cofferdams consisting of 14m and 16m long piles. Due to the works being in the tidal zone, co-ordination to maximise the workable hours at each section had to be undertaken to achieve the programme. In order to do this two telescopic leader rigs and three crawler cranes were used throughout the project. This involved working split shifts and also night-time tidal work. Another logistical challenge encountered was that the lay-down area for the pile and bracing steel, and site accommodation, were located some distance away from the work area. This meant requirements for piles & bracing steel had to be closely monitored and movements of steel to the works area co-ordinated to ensure that the correct steel and piles were available at the correct time. 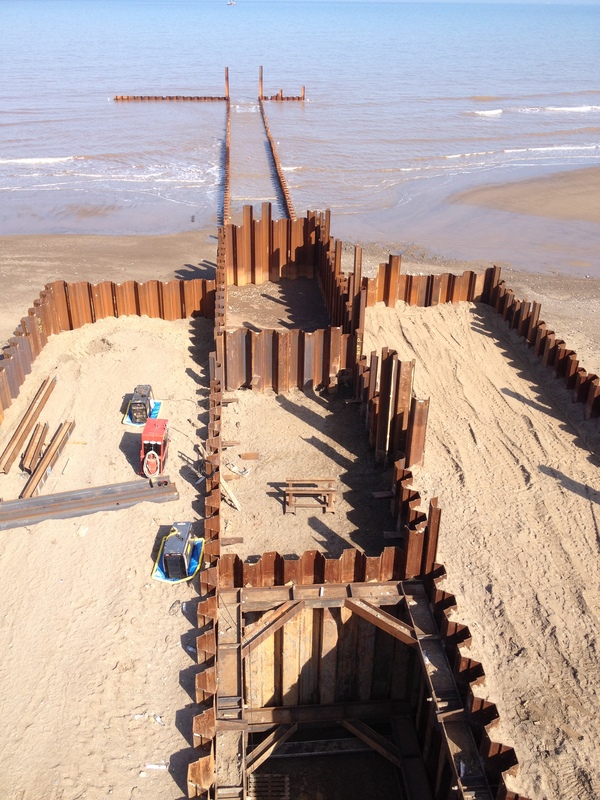 Once the sheet piles were driven the bracing then had to be installed, this included ten frames for the pipe pull trench, and two levels of bracing in each of the landward cofferdams. Also, tie rods had to be installed to the wing-walls and to one of the landward cofferdams. Following the excavation, pipe pull operations and backfilling, SPUK then undertook the extraction of the sheet piles and bracing frames.